Growing up in Connecticut, Tom spent his summers and winters visiting Vermont. He moved up here to attend the University of Vermont for a degree in environmental studies with a focus on ecology and conservation. Upon graduating from UVM, Tom worked for Burlington Parks and Recreation and found it was a great way to interact with the community while experiencing the parks system in and around Burlington. Tom also helped set up Burlington Waterfront events, concerts and festivals and worked as a dock master at the Burlington community boathouse. 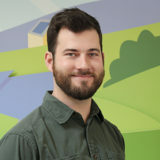 Tom’s introduction to the world of energy happened while working at a small Burlington-based weatherization/ insulation company where he learned about sustainable building and design. Tom joined the SunCommon installation crew because he wants to help Vermonters improve their quality of life through solar. He feels good knowing he’s making a positive change in the world by going to work everyday. When he’s not installing solar, Tom enjoys reading, sailing, hiking and beer! Tom loves Vermont’s many local craft brews during and/or after a hike or at the beach with a good book, preferably Tolkien.